Later edit: After less than 6 months, on July 1st, 2017, Studio 20 becomes the first (and currently the only) Jasmin Gold-certified live cam studio in the world - the highest possible rank. This certification not only shows the professionalism of our team but also the success of Studio 20`s webcam models, which are currently having together (as a team) the biggest revenues in collaboration with Jasmin. We can say with pride, but also with an obvious proof, that Studio 20 is the number 1 live cam studio! Apply for a job at Studio 20 and if you get accepted, you`ll have new excellent payment conditions, starting from 1st of September 2017. We want to recruit and help webcam models that want to perform for a live cam studio, that`s why we offer them more than ever. You will have the opportunity to work in a pleasant and relaxing environment. Unlike other live cam studios that appear and then disappear overnight with all the models` money, Studio 20 has over 17 years of experience in the online modeling and countless awards won at major festivals in the online entertainment industry that prove we are a law abiding cam studio and that we pay all contributions and taxes without exception. From their very first day, all our webcam models sign an artist-performer contract, in which are stipulated all the rights and obligations of both parties. Also, once every two weeks, the models sign an addendum listing all the details of their activity in that period of time. Come see for yourself that all we have said is true, schedule an interview to see why Studio20 is the only Gold Jasmin certified live cam studio in the world! You will also be able to ask our representatives to show you the outstanding earnings our models make every month. In order to become a successful model that earns over $10,000 per month, you don`t need any previous experience in the online modeling industry. All we want from you is to be a positive, communicative, ambitious person, eager to fulfill your financial objectives. We`ll handle the rest! In your first 5 days, you will receive the best training available in the online modeling industry. Our experts will teach you all the tricks of this job to help you reach your financial goals as soon as possible. If you still don`t feel confident about your technique after completing the initial training, you can ask the live cam studio for an extra training session. We are constantly by your side and we understand how difficult it can be for a beginner webcam model to succeed in the online modeling industry, so we offer you, besides the initial training period, 24/7 technical support, so you can achieve your goals. At Studio20, the world's biggest live cam studio, you have the opportunity to perform glamor online modeling, which combines friendly conversations specific to non-adult online modeling with significant earnings. This way, beginner webcam models will gain more confidence in their abilities and will become true masters of seduction! We offer you 100% confidentiality and your real name will only appear in the legal documents. But if you want to become a star of the online modeling industry, we can use the experience we have with over 17 years of experience to promote and help you become number 1! This means more traffic and more money for you from both chat and affiliate programs. Once you`re part of our team, you`ll receive individual courses, which will help you evolve both professionally and personally. Because we want you to succeed, we offer you financial help to complete your makeup kit and work wardrobe. If you stay in our team for at least 3 months, you will receive the products we purchased as a gift from Studio20. If you decide to leave before completing the three months period or if you don`t respect your work schedule, then we will retain the value of the products from your last payment. Also, after completing 6 months on our cam studio`s team, you will have quick access to interest-free loans directly from us. If you want to buy a house, a car or if you want to do an aesthetic surgery, you have to bring 20% of the amount, and we`ll cover the remaining 80%. You will return the money you owe in monthly installments from the earnings you make on webcam modeling sites. Studio 20 received the title of ‘Jasmin Certified Studio’, on 11 January 2017, during a ceremony held in Las Vegas, USA, in the presence of CEO Karoly Papp and majority stockholder Gyorgy Gattyan from Docler Holding, the company that owns Jasmin.com. 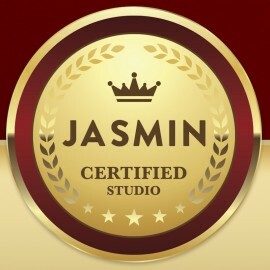 What does ‘Jasmin Certified Studio’ mean? First of all, it is an appreciation of our efforts over the past four years, efforts that have resulted in dozens of models that Studio 20 has trained, helped and promoted to reach the Jasmin top, earning over $10,000 per month: Devious Angel, Raquelle Diva, Sasha Red, Lexie Ford, Rebecca000 and so on. At the same time, ‘Jasmin Certified Studio’ title is a recognition of professionalism, expertise, legality, and correctness of Studio 20 in its relationship with all partners, including models and live cam sites. 2017 is the first year in the history of live cam industry when a studio gets this official title and is the best proof of how Studio 20 changed the history of this new artistic activity worldwide. More important than this certification is what is to come, namely a much tighter collaboration between Jasmin and Studio 20, in areas such as models’ recruitment, training, and promotion. Jasmin and Studio 20 share the same niche: glamour live cam, based on communication, friendship, charisma, not on the adult area. If you are a model that works or has worked on Jasmin and want to reach the top, or if you want to start working as a live cam model and want to do this in the glamour area so that you can be proud of your results, then you now have a clear solution for success: Studio 20, Jasmin Certified Studio. Studio20 is a fair and law abiding live cam studio that has built its reputation with a lot of work and dedication. We want to reach the highest peaks of success alongside our models, so we want in our team only ambitious, motivated and serious girls who are eager to achieve their financial goals. You are always welcome in any of our Gold Jasmin Certified studios, located in Los Angeles, Cali (Colombia), Bucharest, Brasov, Cluj-Napoca, Craiova, Ploiesti, Oradea, Ploiesti, and Timisoara. If you want to open your own successful live cam studio in your town (other than those listed above), you can apply for a Studio 20 franchise. Webcam jobs at the new cam studio in Timisoara! What is the next option if you don't live near any certified studios? I'm I just out of luck? I'm hoping there is another avenue in which I could venture. Looks very impressive. I’m looking forward to seeing the ladies who work here. hello! I am Annette and I have land in Erie Co that I would like to make it an adult photography and video. I only saw live cam studio franchise. do you have statistics on How would a live cam studio vs video and photography studio , would differ financially? Thanks. Hello, My name is Ash , I am writing you about possible becoming a webcam girl . I'm very interested.